There are so many data providers and they’re examined and chosen by files, size of company providing, white papers not segments and results this is a big problem and just one of many. When I started in the data business we made the mistake of using licensed data from all 3 credit bureaus, 4 county record providers, at least 4 demo files, 5 transactional files and even more…What we learned after much testing is all the providers had value but in certain elements not the entire files. We paid for so much redundant data to find the right elements to build our data products. These problems created an entire business unit, we were very lucky to be serving the financial markets which paid top dollar for modeled data products and allowed us to still turn profits after paying all the license fees but after years of building our own products from these files we found in each file components of what we needed and cut out the rest of the files. The process was intense and needed a lot staff heavily educated and experienced in modeling and data science to build products to test and then cut the necessary elements and coverage. The amount of variables were insane from geographical coverage, criteria validity, hygiene, data freshness, audience reach and match rates. We also needed to include the sales team to ensure we were building something based upon real client feedback and demand. The next step was my partner and I renegotiating terms with our data providers from full licensing agreements to partial segment agreements…only paying fees for the data segments needed to create our unique products. We had to prove there was more financial upside to on demand and segment licenses versus full file installs. Not an easy sell considering the ease and profit of dropping off a full file every week, month or quarter and having us do all the hygiene and dedupping. We learned omitting data was just as important if not more than allowing data. We negotiated based upon update cycles, batches of elements, higher prices for more utilized data sets and selects, and even longer term agreements if we had to, we knew this was risky but we saw the reward and huge unique selling proposition for our company. Some vendors laughed, some played ball, some took advantage (or so they thought) with higher pricing…our key to the pitch was our training of our sales reps to sell data the same way we needed to buy it and would build it was going to make us all more money. We were going to productize data in a way never done before. There is so much more data now traditional, cookies, ip, set top box, survey, network and social but I see no difference in how it is needed to be purchased and sold. However the difference I see is now it’s my job to get third party companies to follow a business and sales model we created versus my own employees. I need their trust that it will work and their clients will see better performance. I look at the adtech and martech space and still see these remnant buys with some audience data packaged but not enough lift in pricing and audiences that are still way too large to serve too…so too much data and not enough emphasis on a sales team that understands and can pitch the value in data elements being muti-compiled to create smaller audiences to create higher returns for the providers, the servers and the end user all simultaneously and this is possible…it’s being done but not enough. The data providers are not offering the two key services needed to make this harmonious success theory a reality…training and support. Constant training and support. I logged into a native ads platform I know pretty well to launch a B2B campaign for a client of mine, simple steps went smooth, loaded the advertorial, pictures, URL etc. Below was the select audience data immediately I selected a source I am very familiar with I have worked with their data for years. So I began with 3 selects and pressed NEXT, the spinner started and just kept spinning until it crashed…OK mistakes happen so I started it all again and it crashed again. I ended my attempts to run the campaign the third party and the source lost utilization from me. The data was not installed properly, the match process was not reaching out and grabbing right and the MVC was not stable so no sales and no campaign for my client…everyone loses. The best examples to this training model I can give are Oracle and Salesforce, two companies that created products that created huge value for them and their clients by having powerful consulting businesses constantly providing training on use of the products and the data the products provided. So now these two giants are buying the data companies and slowly attempting integration into their existing software products while also creating separate data sales business. The wall they are hitting is lack of utilization and ability to sell premium data products. The data is being utilized by companies trying to increase performance but not the price for that performance. This makes 0 sense to me, quite simply you buy a Porsche Carrera at one price and a Turbo at a much higher price…the turbo performs better and offers more…and it’s evident. Building better performing data products and audiences if done right should be evident right down to the bottom line of both the provider and the end user, which means both parties should increase price for value. So how do we change what needs to be changed to make this happen? Same way Oracle and Salesforce became multi billion dollar companies, provide the product and train the end user on how to best utilize it and sell it. Sales training by the vendor an old software model that needs to be packaged and delivered properly for data. I remember years ago at Red Clay when the reverse mortgage business started booming and we were crushing direct mail response rates for a solid year, then those response rates started declining fast. We needed to change the audience. So we took in a ton of campaign data the positive data and the new negative data and looked at the changes…the ah ha moment came when we needed consumers with more debt management issues. So we had to use one of our vendors that had more late payment coverage. We immediately switched the late payment criteria from one bureau to another and instead of 60 day lates we went with 90 to 120 day lates…BOOM response rates went back up in tests. Now we had built a new and improved data product for reverse mortgage that would double our competition’s response rates, next was a series of sales meetings that included all staff involved with product creation to create new pitches that documented how we built the file and the new and higher price we had to demand for it because with these response rates clients would double their profits. This example is so agnostic to any data product/service, any audience, any use of data from traditional to digital to research and planning utilization. But it takes this holistic approach of all the teams working together, collaborating and being intimately involved from problem to solution to really embrace, trust, get excited about and sell the product. This requires training! 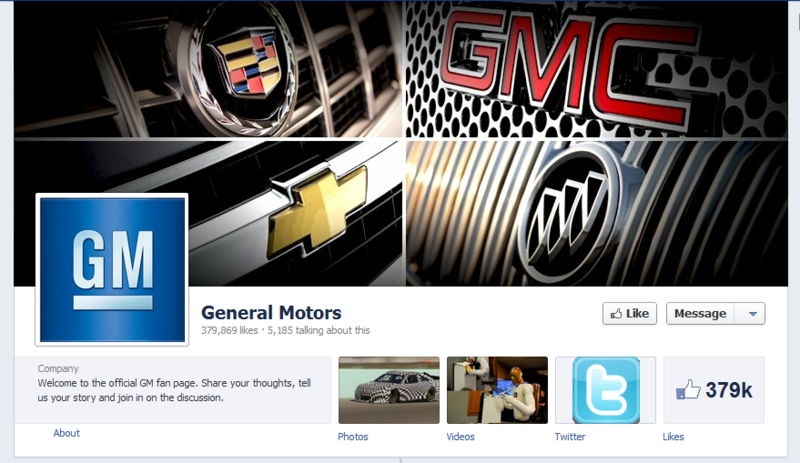 GM to Stop Advertising on Facebook – was GM really advertising in Facebook? Missing communications and social context. Message to who, with what goal and how can reaction be expected here that would lead to engagement, word of mouth, or sales lift? Advertising is now more dynamic than ever so I agree budgets, creative and marketing communications should move with the engagement and the goals faster. However for a brand like GM that has the budgets for Super Bowl and mass community management I think the decisions being made are not dynamic just drastic. If GM were to run a Super Bowl ad that led to an engagement campaign and reduced spending in other areas that are not as measurable, success could come possibly in a short period of time. TV is still a huge advertising channel but for who and for what and why is what we need to know before planning a TV campaign for a client, especially with the reach, relevance and engagement available to us with digital video. We really now have the exciting opportunities to iterate, personalize, and optimize ads based upon real human behavior and opinion via socnet. The data is enormous now but the data is enormous now, so that said I think the key is paying close attention to optimize all media up and down the marketing funnel, “arbing” properly the creative, content, context, media and goal. Our minds are like parachutes, they only work when they are open, and allow freedom of thought minus the fears. Think prospect relationship management is what I tell my clients, try not to crash the dinner party get invited, deliver a message that is more natural, use the social windows properly and combine them with traditional media and methods. PS – I wouldn’t hide any cars in some odd place and try to get people to find them and don’t think more celebrity power, think influence, reach and seduction. There is plenty of opportunity to be effective right down to the dealer and point of purchase level with engaging, efficient, unique, and seductive marketing communications. The data can lead you there. is it rational or subjective? All things health, psychology and happiness to get more out of life!